Mix all ingredients and stir until a dough is formed. It will be sticky, let it sit for about 5 minutes or so until it’s easier to work with. Coat baking sheet with EV Olive oil and sprinkle with a little more corn meal. Wet your hands with water or olive oil to help keep the dough from sticking to them and press onto baking sheet about 1/3 inch thick in a circle. You should get about a 10 inch crust out of it – if it’s a lot smaller than that you are making it too thick. Bake in a preheated 375° (F) oven for 12 minutes. Remove. Add toppings. Bake for another 15 minutes at 350° F. Remove. Cool. Eat. Be happy! On top of pre-baked crust I used a layer of provolone cheese slices (putting the cheese first keeps the crust from getting soggy.) Add pizza sauce (tomato paste, sea salt, cayenne pepper, Italian seasoning, water, balsamic vinegar), add cooked ground bison with mushrooms, lots of garlic, onion, cayenne, and Italian seasonings. (I made this yesterday.) 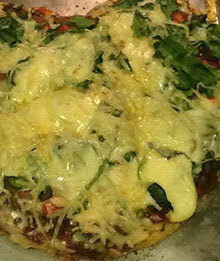 I also added chopped red bell pepper, jalapeno and green onion, spinach and topped with mozzarella and parmesan cheeses.